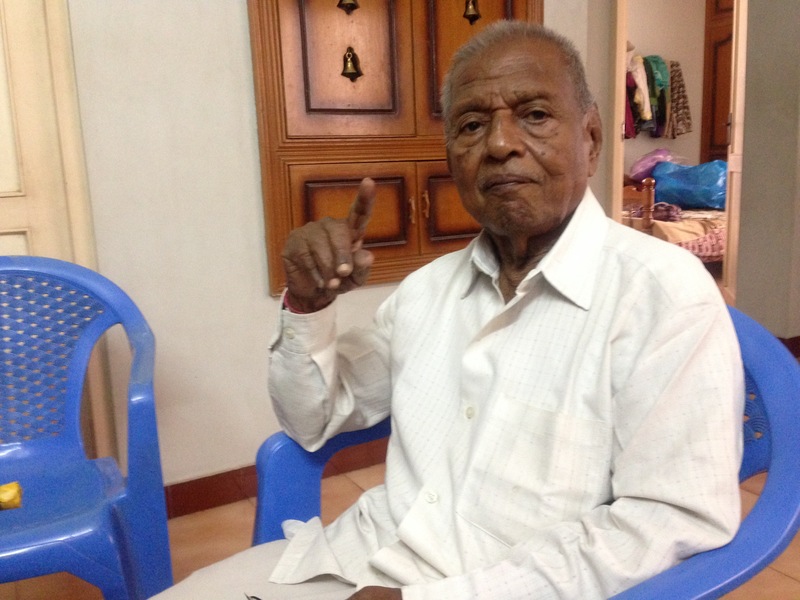 CATHOLIC SCHOOLS ATROCITIES » Mr. Vidyanandan, the real Expert! Mr. Vidyanandan, the real Expert! 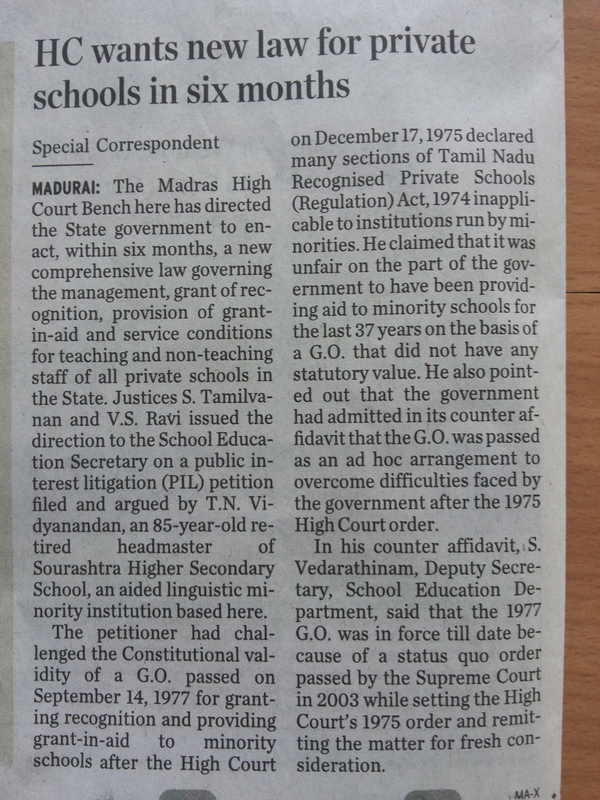 Mr. Vidyanandan was dismissed from service many years back from the minority school, namely Sourashtra Hr. Sec.School, Madurai. But he did not loose hope. He struggled hard to come out of this problem. He became a lawyer and he argued his case as party in person and won the case after getting an order from the Apex court. He used right of appeal and got his job. He has been working for the better service conditions of the teachers working in minority schools all over Tamilnadu. He has filed a number of cases to reach justice. His motto is “Be brave to be honest and be honest to be brave”. His photo is published here. Every one has to appreciate this warrior for his wonderful, continuous, untiring and selfless service for the welfare of the teacher community working in various minority schools in Tamilnadu. Even in this hot summer (May 2016) he has gone to Delhi to file SLP for the welfare of the teachers. He is the best person who has thorough knowledge about minority-right cases filed by the minority managements, appeals of government, review petitions, additional petitions and so on. He can cite any rule or clause or amendments on the spot without having papers in his hand. He is a very kind person and accessible to any one for legal advice in school and minority issues. Any one can get legal advice in the school issues, especially issues relating to minority schools. He says that all teachers working in minority schools should enjoy service conditions in accordance with law. He further says that the service conditions for the minority school teachers have not been taken away by any order. His efforts are like planting trees of rights in the garden of minority schools for the enjoyment of teachers. We have to salute him and honour him for his selfless service. His family is also supporting him for his selfless social service. The Indian Express has published an article about him on 14.03.2016 in the Madurai Edition. To read the article please follow this link. Indian Express news AVE MARIA is always grateful to him for his wonderful guidance and free legal support. He is the real expert! I feel immensely happy you do right acts/services to the catholic community. The unfair acts continue not only at Tuticorin Diocese but also in every RC Diocese in Tamilnad and Puducherry. It is not only in Diocese but also in Religious Congregation. The State is also main cause to convert education as commercial enterprises. As an individual I also initiated criminal OP against Madurai Arch Diocese on FCRA and Society Act,1975. 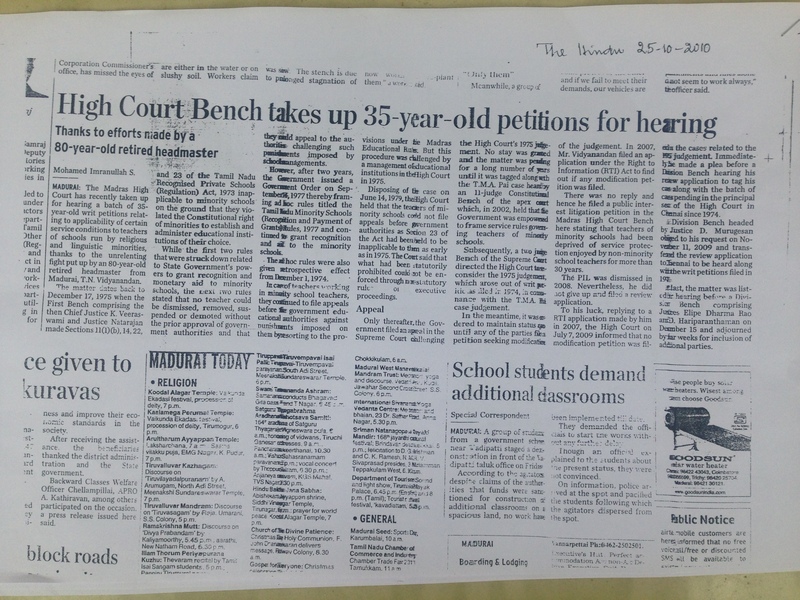 I was compelled to withdraw by the Hon`ble High Court which granted liberty to file private compliant. Please be kind enough to forward some of your Affidavits filed in Writ Petitions and SLP so as to furnish my comments. Until then I congratulate your efforts and services. My best wishes and whole heartfelt thanks to you.